RM Sotheby’s ‘Duemila Ruote’ (2000 Wheels) in Milan in November 2016 will be the largest automotive-themed private collection sale ever staged in Europe. This multi-day sale scheduled for the weekend of 25 November 2016 in Milan, Italy, will feature over 430 cars, 150 motorcycles, 60 boats and hundreds of bicycles and automobilia items. All lots will be offered without reserve. RM Sotheby’s will present the ‘Duemila Ruote’ (2000 Wheels) multi-day classic car and automobilia sale in Milan, Italy, the weekend of 25 November 2016. This major auction will coincide with the Milano AutoClassica – the Classic & Sports Car Show – held in Milan the same weekend. 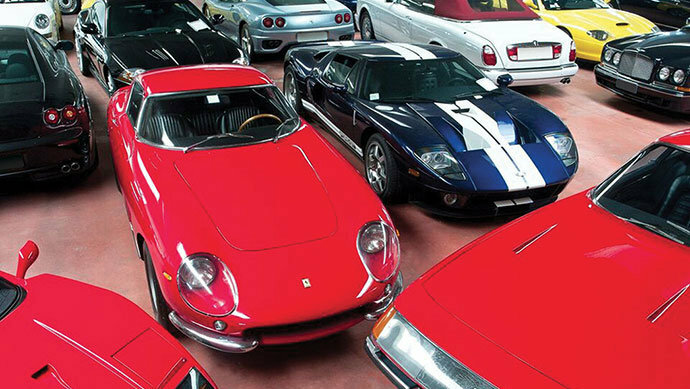 The multi-day auction will feature more than 750 lots, making it the largest, automotive-themed private collection sale ever staged in Europe. All lots – including automobiles, motorcycles, bicycles, boats, bobsleds and automobilia – will be presented “without reserve”, setting the scene for a very exciting close to RM Sotheby’s 2016 global calendar. The sale will be held at Fiera Milano (www.fieramilano.it), one of the world’s largest convention and exhibition spaces, in a dedicated hall inside the Milano AutoClassica. Combined, the two events will make Milan the focal point for the collector car community this November. For car enthusiasts, the collection’s automobile offering counts over 430 lots and has an almost exclusive focus on performance, featuring a terrific series of rally, race, sports, GT and supercars. Leading the charge is a trio of highly desirable Ferraris: a rare, matching-numbers 275 GTB/6C Alloy; a desirable Plexiglas-headlight 365 GTB/4 Daytona; and an F40. Long hidden from public view, the 275 GTB is one of only nine cars originally fitted with alloy bodywork, six carburetors and torque tube. Alongside the rare Italian machinery from Ferrari, Maserati, Alfa Romeo, Fiat and Lancia, the collection also showcases a tremendous range of Porsches, Aston Martins, Jaguars, Rolls-Royces and Bentleys, in addition to numerous other luxury and GT cars from blue-chip manufacturers. Additional highlights include a 2005 Maserati MC12, one of only 50 examples and showing just 6,000 kilometres on its odometer, along with a 1989 Lancia Delta HF Integrale 16V ‘Ufficiale’, a factory works rally car. The motor car offering is complemented by: an assortment of some 150 motorcycles, highlighted by a diverse mix of BMWs, Triumphs and Ducatis of all eras; a selection of 60 boats, including various interesting, historic Italian racing hydroplanes; and some 140 bicycles, including numerous historic ‘Tour de France’ road bikes. Also set to go under the hammer, a fascinating selection of bobsleds and automobilia, including porcelain signs, valuable and rare wheels, engines and other highly desirable parts. In advance of the auction, two vehicles from the collection—the 1966 Ferrari 275 GTB/6C Alloy and the 1989 Lancia Delta HF Integrale 16V ‘Ufficiale’—will be on preview at Auto Moto D’Epoca in Padua, Italy, 20-23 October.